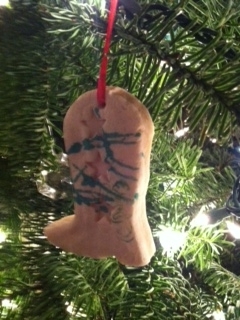 Desperate for a rainy day activity, I remembered back to when a babysitter in days of past made cookie ornaments. It dawned on me that Bobby might like doing something like that, after all he does love to play with playdough. Salt-dough is basically the same thing but more keepsake friendly. The difference between the two recipes comes down to oil – play dough has it, salt-dough doesn’t. Consequently salt-dough dries hard giving lasting life to your child’s creations. The good news is that kids can play with the dough for days (just keep it airtight) and then dry their creations for further play or even gifts. Here’s how to make salt dough. Take 2 cups flour, 1/2 cup salt and 3/4 cup warm water. Mix all ingredients and kneed for 5 minutes. Then play! We made animals and even cookie cutter ornaments in the shapes of cowboy boots as Bobby has been really into Woody from Toy Story lately. If you decide to make ornaments, make sure to make holes in them before you set them out to dry. Straws make perfect holes. Drying takes about a week. After they are dry, you can color them with paints or markers. As a side note, making cookie ornaments also provides a way to teach a bit of history. The whole tradition of decorating a Christmas tree started in Europe. Back then trees were decorated primarily with food and candy as a symbol of giving thanks for daily bread. Wishing you rainy days filled with fun! This entry was posted in crafts, ornaments, rainy day fun, sonoma, Uncategorized and tagged holiday crafts, rainy day fun, salt dough on November 28, 2012 by Modern Mama.